Those billboards haven’t been used for years, they’re shabby yet they ironically proclaim that Ebbing is a place worth stopping for. In truth, it’s a small, non-descript Midwest town and the billboards are on a road nobody has used since the freeway opened nearby. But for Mildred Hayes (Frances McDormand), they’re exactly what she wants. It’s seven months since her daughter was raped and murdered and the police don’t seem to be doing much to catch her killer. Renting the billboards, she uses them to display massive posters, strong arming police chief Willoughby (Woody Harrelson) into taking the case more seriously. And they turn out to be a catalyst for a series of events that shake both the town and individuals. That’s the essence of the story, but there’s more to it than Mildred’s unconventional approach and her constant, burning anger. One of its greatest strengths is the way the characters are both written and brought to life with such accuracy and conviction. There’s one of Willoughby’s officers, the dense but permanently angry Dixon (Sam Rockwell), whose rage is already the subject of conjecture and which eventually boils over spectacularly. There’s Willoughby himself, a surprisingly sympathetic cop with his feet firmly planted on the ground and a gift for ironic humour. And there’s Mildred’s ex-husband, Charlie (John Hawkes), who left her after their daughter was killed and took up with a 19 year old who’s all about appearances but little else. They all come together for a fascinating, multi-layered piece of cinema, which appears to be one thing on the surface but turns out to be a whole lot more underneath. 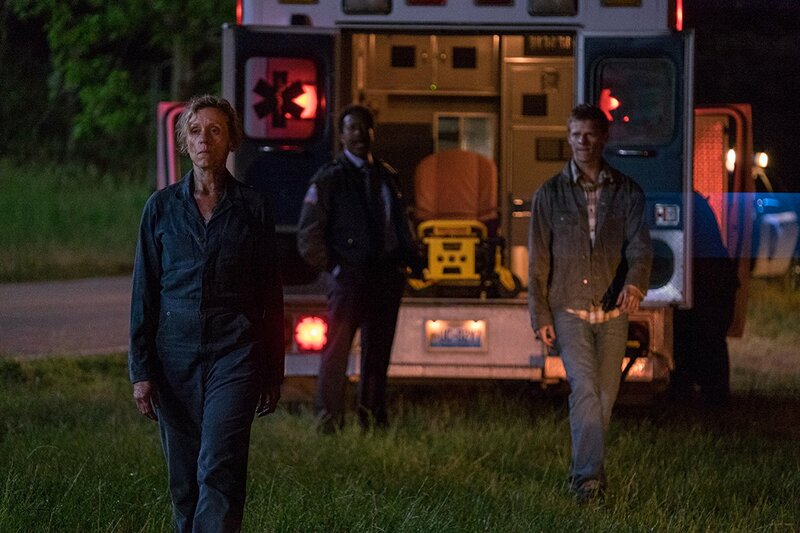 The humour is a given – pitch black, sour and a verbal tour de force from Martin McDonagh, who also writes, and his main mouthpiece, Frances McDormand. Yet it’s not of the one note variety, as Harrelson’s Willoughby demonstrates. It’s a police procedural as well, as the small town cops flounder to find the perp, but floating to the surface as well are heavyweight themes like parental love, justice, revenge, grief …. all interweaving seamlessly. Ultimately, this is the formidable Mildred’s show: she’s not one for holding back on her opinions or feelings and it’s an equally no holds barred performance from McDormand, the best thing she’s done in ages. Anger and gloriously ripe language are just the start, because there’s a compassionate woman underneath all her rage and talent for invective. From the occasional flicker of humanity in the first half of the film, her heart becomes increasingly in evidence and she’s not the only character to go through the proverbial arc – watch Dixon come close to being an unlikely hero. Helped by McDonagh’s meticulously crafted script, Rockwell delivers a career best performance, leaving his customary quirkiness on the other side of the opening credits. Put simply, Three Billboards is a triumph, one acknowledged by the Golden Globes over the weekend. It’s astonishingly good, deeply satisfying, complex and with humour frequently poised on a knife edge. It’s that rare cinematic thing – a wonderfully complete film. Stars: Frances McDormand, Woody Harrelson, Sam Rockwell, John Hawkes and Caleb Landry Jones. Three Billboards Outside Ebbing, Missouri is out on the 12th of January.